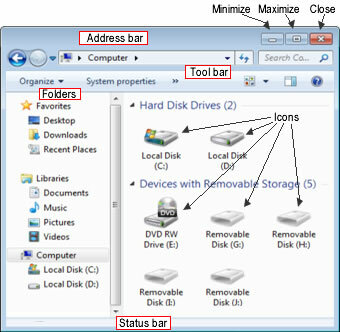 The Desktop offers many features that make using your computer easier. You can easily start programs or applications, copy and move files from one place to another and drag and drop files and program where you want them on the computer or even on to a program's icon to open a file. Open and Save menus are streamlined to allow all applications to have the same basic features plus program specific features. Operating systems are often backwardly compatible with older system so that older programs will run. Usually when new programs are created they are designed to work with the newest operating system to allow them to use all the newest features. The Start Button or Apple menu starts programs, opens documents, and access most parts of the system. Windows Program and Apple Dock menus can be customized as needed. All programs, folders, tasks and most other operations open in a window. Many backup options can be done automatically by the computer. Automatic backup software will provide various options to recover files in a crisis but a hard drive error can happen at any time and without warning. Be sure to back up all your personal and business data on a regular basis. If you have a second hard drive, files can be backed up to that drive. A CD/DVD or flash drive can also be used to make a back up. When backing up files don't forget your email and address book. Browser favorites and/or bookmarks can be backed up as well. Check your email, address book and browser for information on backing up these files. Many programs have an export feature that can be useful when making back ups. Files can also be syncronized for backup with a cloud storage account. It is important to develop a filing system early. Create a folder on your Desktop to store your data. Create sub-folders within that folder to sort the various documents, image, sounds and other files that you create and use. A new folder can be created easily and given a logical name which will help organize data.